What can happen when an actor, a food blogger, a film critic and a gadget guru are trapped inside boxes so a tablet manufacturing company could prove its point? 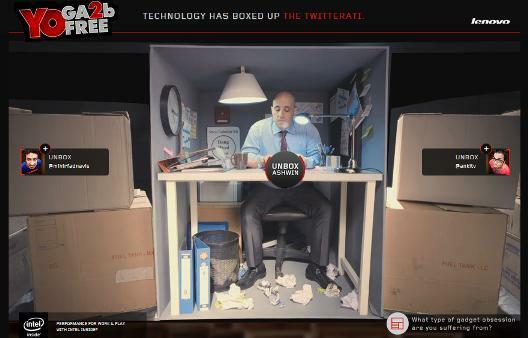 The result is an innovative digital campaign that highlights the key product benefits of the tablet. Gadgets are designed to help us lead a more connected, productive and fun life. But take them out of the box and you often see yourself enslaved and tethered to these devices. Do gadgets make us free or do they in reality box us up? Lenovo India is putting the spotlight back on technology that is designed to adapt to the user with its newly launched Yoga tablet 2 range. And it’s doing so with the help of four well-known Twitter influencers – actor Ashwin Mushran, gadget guru Ankit Vengurlekar, film critic Mihir Fadnavis and food blogger Kalyan Karmakar, through an interactive video-based digital campaign called ‘YoGa2bFree’. 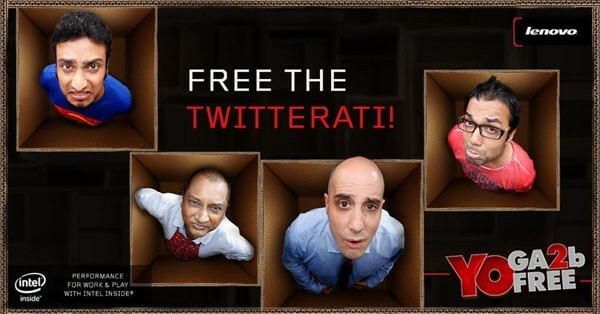 YoGa2bFree has a dedicated website where the four guys are trapped inside boxes depicted through interactive videos. They can only be set free with the help of gamified clues within the website. In the process of hunting for the clues, a user learns about the new Lenovo yoga series tablets that tilts, holds on, stands or hangs, as per one’s wish. And what’s in it for participants? A chance to win the new Yoga tablet! The digital and social media execution has been designed by Lenovo’s digital agency Experience Commerce. Actor and comedian Ashwin Mushran is trapped inside his office and wishes his tablet could be raised at a better angle towards him, so he could finish off his work faster and wind up for the day. If you listen carefully to his problems explained in clue a and b, you will find the right feature to unbox him. The right answer is within the website itself. If the answer you’ve typed is wrong, you find an agitated Ashwin whining away, else he is seen with the new Lenovo Yoga 2 and a big smile of freedom on his face. A similar interactivity has been designed for gadget guru Ankit Vengurlekar popularly known as gadgetwala who is trapped inside a train and badly wants to be able to reply to his emails. Food blogger Kalyan Karmakar popular for ‘Finely Chopped’, one of India’s finest food blogs is trapped inside his kitchen, as he wishes his hands could be free while cooking his favourite recipe and referring to it on his tablet. Film critic Mihir Fadnavis who likes to watch movies while lying on his bed is trapped there. You watch a very frustrated Mihir holding his tablet with both hands and shifting the pain of holding from one hand to another from time to time. I managed to unbox all four with the help of the clues and qualified for a chance to win the tablet! One can login through their Facebook or Twitter accounts after having unboxed any of the trapped characters. The website also provides social sharing buttons in addition to information about the tablet and the Flipkart link to buy it. #Yoga2bFree conversations have been pulled up from Twitter and Facebook. The brand’s social media networks on Facebook and Twitter are spreading the word, along with the four Twitter influencers. Buzz was created prior to the campaign launch with the help of Vine videos and visuals featuring the influencers and the first mentions of #Yoga2bFree. Lenovo India has cherry-picked the right influencers from each of the four major business domains of technology, food, films and comedy. Each of the influencers – actor Ashwin Mushran, gadget guru Ankit Vengurlekar, film critic Mihir Fadnavis and food blogger Kalyan Karmakar – enjoy a large following on Twitter along with being an expert or a trusted source in their particular domain. By leveraging them, Lenovo India has tapped into their trusted communities and a diverse target group for the promotions of its Yoga 2 tablet. The significant part of the campaign is the concept of putting them into boxes and having users unlock clues to unbox them, while they learn about the adaptable multimode feature of the new product. A clever and fun way to demonstrate the benefits of the new product! The interactivity of the videos is impressively smooth and together with the storytelling makes for a fun user experience. While influencer marketing has its own challenges, if done right, it can help build a memorable product launch just as the #Yoga2bFree has done for Lenovo Yoga 2.